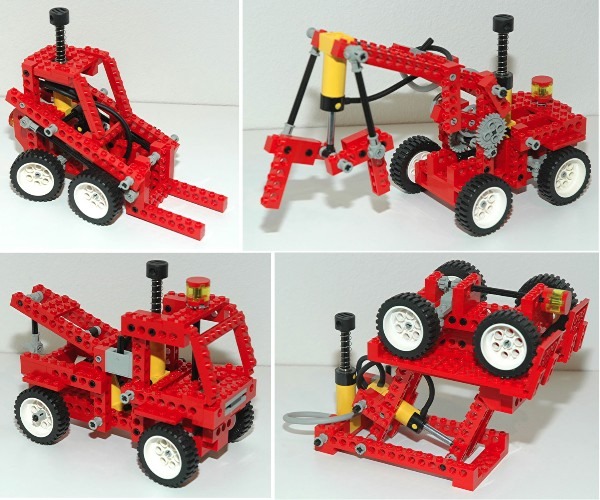 1989 was a major year for Technic. It featured 7 new Technic sets, four of which were Universal Sets, and the introduction of a new double acting pneumatic system. The first two universal sets are relatively small and each builds 4 models. The third universal set features one of the pneumatic cylinders which is incorporated into the 4 models in a number of innovative ways. The fourth universal set includes a 4.5V motor. 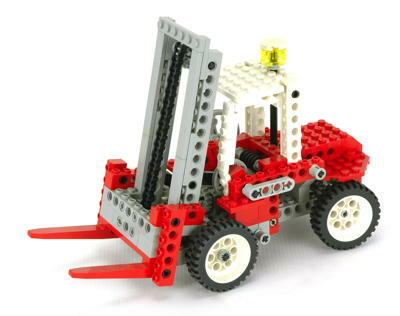 The forklift features steering and a new chain driven fork mechanism. 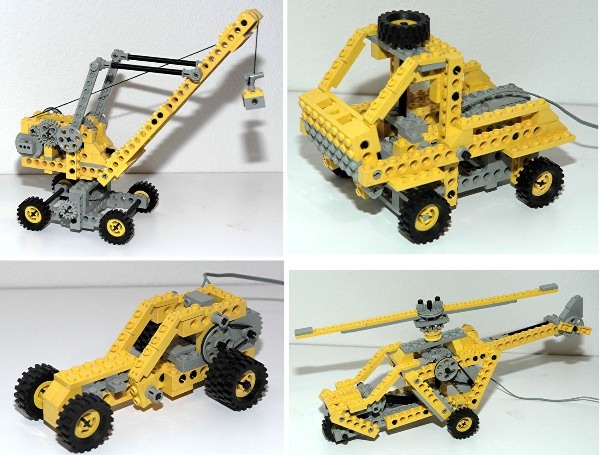 The power crane, although only the second Technic crane, is packed with features including steering, outriggers, a pneumatic luffing boom which also telescopes and slews, and a cable winch. 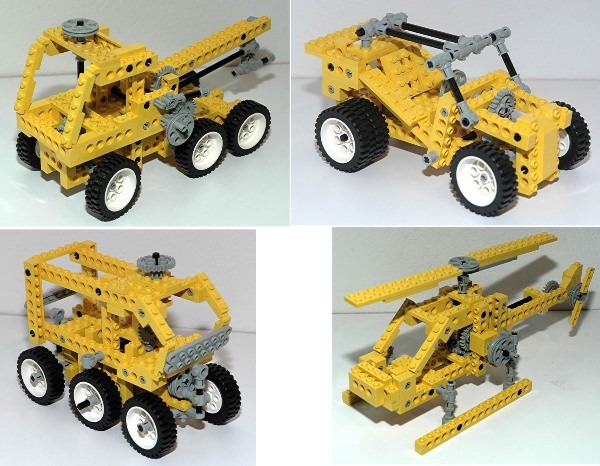 The backhoe grader is perhaps the most complex Technic model to date and features steering, a front lifting and dumping bucket, a rear pneumatic excavator with a luffing boom, jib, and bucket, a slewing mechanism, and outriggers. Several new parts were introduced this year including the new pneumatic system, the first liftarm, and a special long gear rack. The pneumatics would be used in this new configuration, virtually unchanged, for decades. Liftarms were a sign of things to come as eventually variations on this theme would replace even the venerable Technic beam. The old pneumatics had lasted only 5 years, but the replacement was an improvement in every way. The motorized universal set, although only the 3rd set to come with a motor, marked the end of the 4.5V motor system. In my opinion, 1989 marks the beginning of the golden years of Technic. During these years, many new models were released each year, many of which were quite complicated. 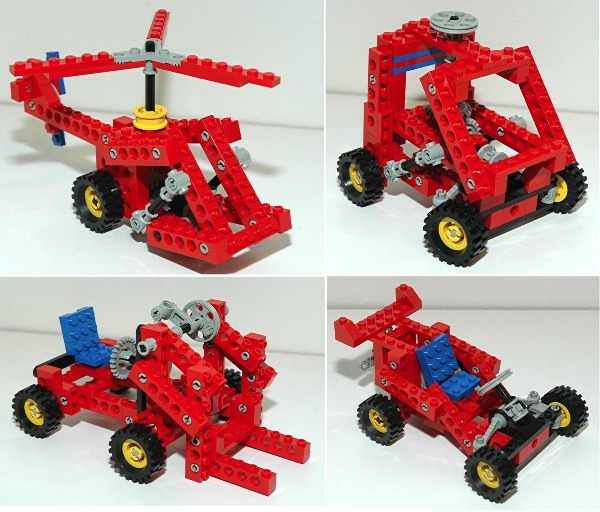 Each year marked the introduction of many new parts and building concepts. This would go on for nearly a decade before the dark years set in and Technic would begin to lack any sense of coherence. This second generation pneumatics, released this year, fixed all the problems of the previous system. The double acting cylinders could be pressurized on either side, allowing significant force to be generated in either tension or compression. Actuator: There are two pressure ports, one at the head end for extension and one at the rod end for retraction. The limitation on the force is that the piston head internal to the actuator (or pump) will begin to leak after a certain pressure, acting as a pressure relief valve. Since the annular area of the rod end chamber is smaller than the area of the head end chamber, the maximum tension force of the actuator is smaller than the maximum compression force. This is why most real hydraulic construction equipment orients the actuators so that the power stroke is during actuator extension. Pump: The pump has the same lower housing as the actuator. The upper end is a large piston with a compression spring return. Switch: The switch is the same as under the old pneumatic system. The switch is really a pneumatic selector valve and is the size of two 1x2 bricks. The outer ports are connected to the two ports of the actuator. The center port runs to the pump. When the switch is at the center position, all ports are blocked. When the switch is moved to one position or the other, one of the outer ports and the center port are connected to the distribution block and the other is vented to atmosphere. Compression Summary: Depression of the pump produces pressure. Pressure flows to center port of switch. Pressure flows out enabled port to actuator head end, extending it. Return pressure from the rod end vents through the other port of the switch. Return of the pump draws in air through the switch. Tension Summary: Depression of the pump produces pressure. Pressure flows to center port of switch. Pressure flows out enabled port to actuator rod end, retracting it. Return pressure from the head end vents through the other port of the switch. Return of the pump draws in air through the switch. The new liftarm part is 1x4 with an axle slot at each end. 3/4 of the part is 1/2 stud thick, with the far end a full stud thick and notched to fit between 4 studs on a plate or brick. This part could be used as a crank and served as the prototype for many other sizes and shapes of liftarms to come which would be used prolifically for decades. A new rack gear was introduced which is much longer (1x20) than the old 1x4. The gear teeth are recessed rather than standing proud of the base plate like the old rack. This rack is used principally to telescope long structures such as the boom of a crane. 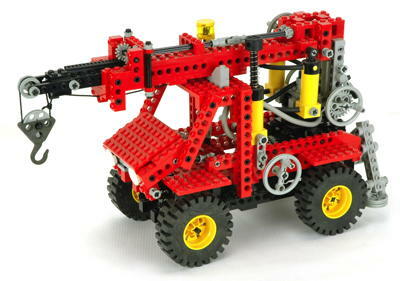 It's uses are not limited to Technic and, in fact, it was only ever used in one Technic model. A special part was introduced to act as a fork for forklifts. It was only ever used for this purpose in Technic (on 4 different fork lifts). It is quite rigid and can support considerable weight. A new hook part was the first all metal part in Technic. The significant weight of this part helped to keep the cables attached to it pulled taut. A special brick appeared (new to Technic) which was 2x6x2 and filled with ballast. 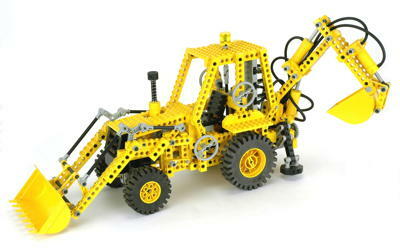 It was only ever used in three Technic sets to counterbalance heavy structures which could otherwise tip.